This was a great dish to do the chopping and slicing ahead of time. Then dinner came together in less than half an hour. It turned out even better than the restaurant version! We will DEFINITELY be adding this to our regular dinner rotation!!!! Also, this is a mild. 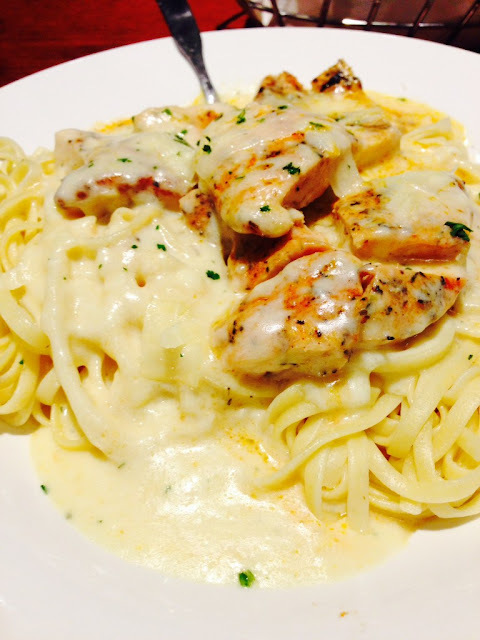 family friendly version of Cajun chicken alfredo. If you want more heat, by all means, increase the creole seasoning, or add some cayenne or red pepper flakes! Sprinkle raw Chicken strips with the cajun seasoning and liquid smoke. Melt butter in a large skillet over medium high heat. Add chicken strips and chicken for 5 minutes. Add the mushrooms, red and green bell peppers, and green onions. Cook for 3 more minutes, stirring every minute. Add cream and seasonings. Bring to a boil. Stir and reduce heat. Simmer for 20 minutes or until thickened, stirring occasionally. Remove from heat and stir in Parmesan cheese and garnish with parsley. Toss with noodles and serve. 0 Response to "CAJUN CHICKEN ALFREDO"